Good Shepherd Sunday is the Fourth Sunday of Easter. The name comes from the gospel reading on this day, which are taken from tenth chapter of John. Christ is the Good Shepherd who, by dying on the Cross, lays down his life for his sheep. Dom Henry Wansborough writes in this week’s Wednesday Word that to think of ourselves as woolly and cuddly sheep, obedient to the shepherd, would be a mistake. Sheep are renowned as being silly, contradictory creatures, always starting off in the wrong direction, getting themselves into tangles and difficulties. In the Holy Land they are scraggy beasts, pastured on rocky and often dangerous ground, amid boulders and cliffs, threatened by wild animals and marauders. The shepherd needed to be on the alert to save the sheep from hurting themselves….. So Jesus as the good shepherd is kept well occupied by our foibles, our stubbornness, our mistakes and our fears. What do you value most in those who guide you? In recent times this day has also become known as Vocations Sunday, a day on which prayers should be said for vocations to the priesthood and religious life. The celebration of Good Shepherd Sunday is an opportunity to pray that the Lord will raise up more people to inspire the Church as priests and consecrated women and men. This is a moment of prayer for these specific vocations. Everybody is involved in the work of this Sunday, a time of grace for all the faithful as we pray together. Come along to our parish QUIZ NIGHT on Fri 15 May 2015 at 7.30 pm in the parish centre. £5 per table (payable on the night). Maximum of 4 adults per table. Bring along your own drink (and something to eat if you like). See the poster for more information. This year the Church is celebrating the Year of Consecrated Life. Locally, we will be closely involved in September 2015. But you might like to know that Pope Francis is asking the church’s religious sisters, brothers and priests to ‘wake up the world’ with their testimony of faith, holiness and hope. There will be a mass on 17 May at Sacred Heart, Wythenshawe, celebrated by the Bishop as part of our diocesan celebrations for the Year. There will be another mass in September at St Anne’s, Rock Ferry. LORD of the Harvest, BLESS young people with the gift of courage to respond to your call. Open their hearts to great ideals, to great things. INSPIRE all of your disciples to mutual love and giving— for vocations blossom in the good soil of faithful people. Amen. Parish Summer Fair Sun 5 July after mass in the parish centre and church grounds. Next planning meeting for stall-holders, helpers and others interested is on Mon 11 May at 7pm in the presbytery. St Anne’s are having a FAMILY FUN DAY from 1pm-4pm on 4 May in the Lourdes Hall (face-painting, crafts, entertainment, games, quiz, Irish bingo, refreshments). Sounds great. £5 family ticket or £2 individual. Please pray for our sick and those who care for them Pray also for those in the parish who do not wish their illness known publicly. If anyone who is sick would like a home visit, please let Fr Bernard or one of the deacons know. Steven Francis and Hannah Szpak are being married here at St John’s next Saturday at 12 noon. Please remember them in your prayers and all couples preparing for marriage here and elsewhere in 2015. Next Weekend there is the Annual Mission Appeal at both Masses which this year in Shrewsbury Diocese is being given by the SMA Fathers. CaFE (Catholic Faith Exploration) – This coming Thursday, 30 April, the third module “The Father’s Love” will be held in the Parish Centre from 7.30-9.00pm. Further sessions follow in succeeding weeks. We are, all of us of whatever age, invited to reflect prayerfully with Fr Christopher Jamison OSB on Sat 16 May on our calling in the Church’s mission to the world at a LAY VOCATION EVENT at Ellesmere Port Catholic High School, Capenhurst Lane, CH65 7AQ from 10.30 am until 3.30 pm (£5 contribution on the day). To book a place, email pauline.mcculloch@dioceseofshrewsbury. org. Amended Notice: Do you have children who are current Year 8 children who will be Year 9 in September who want to receive Confirmation this year? We are having an overnight “Confirmation Gathering” fun-event at Barnstondale Activity Centre 8th to 9th May. Please contact Mike Daly on – daly.m or leave your details and that of your child at St John’s presbytery. All details must be received before 30 April to ensure inclusion. Don’t forget to put our monthly singing practice on the second Thursday of the month into your diary (Thu 14 May at 7pm). St Teresa speaks of the straying sheep: The great King, like a good shepherd, whistles softly, making his sheep recognise his voice, so that they will return to their inner dwelling place. Jesus, who had been recently killed on the cross and buried, suddenly appeared among the disciples. Frightened, they thought he was a ghost. But Jesus told them to look at his wounds and touch him. And he asked for something to eat. The community that had experienced Jesus’s dying now experienced his risen presence. This was a presence of sight and sound, of memories and relationships, of love and tenderness. It was a physical, an embodied, presence. And yet Jesus transcended sheer organic materiality. He could appear out of nowhere, through walls and closed doors, and walk on water. It was a bodied existence that was not so limited as ours is now. It is a kind of existence that enters our world yet is not cramped by it. What does this tell us of our own journey beyond our body’s door? Our bodies will somehow be part of it. (If only our disembodied soul survived, that might be nice, but it would not be us. We are ensouled bodies. A separated soul would be incomplete.) Thomas Aquinas summed up the Church’s teaching that we, like Jesus, would have a new bodied existence, truly related to our bodies in this world, but nonetheless freed from their organic disabilities: fully developed even if we died young, fully supple if we died old and frail, capable of every bodied joy, and gloriously transcendent of our every body-wound. These convictions go back to the testimony of our first brothers and sisters in faith and to the understanding of those who experienced Christ in his body, but so gloriously that even his wounds were lovely invitations to faith. Every promise of the body, the splendour of our organic life, shall be lustrous and strong. Nothing good of this wondrous world of sense and sentiment shall be lost. 995 … Encounters with the risen Christ characterize the Christian hope of resurrection. We shall rise like Christ, with him, and through him. 996 From the beginning, Christian faith in the resurrection has met with incomprehension and opposition. On no point does the Christian faith encounter more opposition than on the resurrection of the body. It is very commonly accepted that the life of the human person continues in a spiritual fashion after death. But how can we believe that this body, so clearly mortal, could rise to everlasting life? How do the dead rise? 997 What is “rising”? In death, the separation of the soul from the body, the human body decays and the soul goes to meet God, while awaiting its reunion with its glorified body. God, in his almighty power, will definitively grant incorruptible life to our bodies by reuniting them with our souls, through the power of Jesus’ Resurrection. 1000 This “how” exceeds our imagination and understanding; it is accessible only to faith. Children’s Liturgy Catechists: Please remember the meeting after the 9.30 mass on Sunday 19 April. Are you a parent/grandparent of children in Year 9 or 10 who want to receive Confirmation this year? we are having an overnight Confirmation Gathering fun-event at Barnstondale Activity Centre 8th to 9th May. Please contact Mike Daly on – daly.m or leave your details and that of your child at St John’s presbytery. All details must be received before Wed 22 April to ensure inclusion. We will again sing the new Gloria and mass setting at masses this weekend. They are in our newer green Laudate hymn book: Gloria 1013, Holy Holy 1014; acclamation 1015 and Amen 1018. CaFE (Catholic Faith Exploration) – This coming Thursday, 23 April, the second module will be held in the Parish Centre from 7.30-9.00pm. Further sessions follow in succeeding weeks. The teachings are relaxed, personal and informative, rooted in the Bible, the Catechism, Evangelii Gaudium and reflections on the Holy Spirit from Pope Francis. 220 digital copies of the image (each has touched the original image) have been sent to various countries. Our copy will be in our Cathedral from noon on Sat 9 May until 1.00 pm on Fri 15 May. The Cathedral will be open for veneration of the image from 10am until 5:30pm (7.30am-7pm on the Sunday). Following the 12:12 Mass on Friday, the image will go to Birmingham. It would be wonderful to see pilgrims visiting the Cathedral from across the Diocese . Etty Hillesum was a young Dutch Jewish woman who died in Auschwitz in 1943. At first far from God, she discovered him looking deep within her. In her disrupted, restless life she found God in the very midst of the great tragedy of the 20th century: the Shoah. This frail and dissatisfied young woman, transfigured by faith, became a woman full of love and inner peace living in constant intimacy with God. The day (led by Donna Worthington) is on Saturday 23 May 2015 (from 10.00am to 4.00pm). Cost £20.00 including simple lunch. A reminder to readers involved in the Triduum. Please be kind enough to ensure that your photocopies of Mark’s or John’s Passion are returned to the Sacristy. Open meeting for the Parish Summer Fair on Mon 20 April at 7.30pm in the side chapel. Please come along and help with suggestions! It would be so easy to read the passage from today’s gospel about “doubting” Thomas and then just presume the lesson to be learnt is that it’s all right to have doubts if you hang on to your faith. But if we look closer we might discover that it’s not so much “doubting” Thomas that we see. It’s more like “hurting” Thomas. He has invested all the energies of his past three years in something that looks as if it has ended in failure. His words show that he feels more let down than anything. Thomas is not so much the reasoned agnostic as the disheartened follower. Most parishes have dozens if not hundreds of hurting Thomases. Some of them are young people who desperately want to believe in God, in a sense of purpose to life. They really do have deep spiritual feelings, but they feel that the Church is unable to harness these God-given yearnings. “All my kids have lost their faith” is something we often hear. Maybe they have not lost their faith, but they’ve probably lost yours. Of course, there are many other people whose lives take them down paths that make their connection with the Church less than welcoming. It’s not that they reject the Church. It’s just that they can’t see the point of the Church at this particular moment. But they desperately want to be part of the promise. Interestingly, when Jesus meets Thomas after the resurrection he doesn’t start a lesson on the faith with him. He just takes him as he is. In fact, he repeats Thomas’s own words back to him – a sign of a wise counsellor. Maybe the point of today’s gospel is to remind us how easy it is to mistake confusion and disappointment for doubt. And perhaps we are being invited as a community to be more sympathetic to those who once worshipped and believed with us but who now feel that they are unable to stand up and profess their faith in God and the Church as in former days. We could start by acknowledging that we too have holes in our hands and our side. time, the term came to be used for the document itself.] In this case it was the Bull of Indiction for the Holy Year (Jubilee of Mercy) which will begin on 8 Dec 2015 (Immaculate Conception) and continue until the feast of Christ the King (20 Nov 2016). The Pope intends to explore the fundamental theme of God’s Mercy. The Holy Year should be a time of reconciliation with adversaries and an occasion to promote solidarity, hope and justice in the world. Holy Years normally take place every 25 years unless a pope decrees an extraordinary one for a particular topic. The next one had been scheduled for 2025. As a matter of interest, during a Holy Year, one of the entrances to St. Peter’s Basilica (which is known as the Holy Door and normally bricked up) is opened so pilgrims can pass through it. The Holy Doors of Rome’s other basilicas are also opened. Pope Francis has been making mercy a hallmark of his papacy. Even his motto (miserando atque eligendo) refers to the Lord’s mercy in calling each of us to follow Christ. The theme of mercy occurs thirty-two times in his exhortation to us on the Joy of the Gospel. The pope sees the Church as a “community [that] has an endless desire to show mercy, the fruit of its own experience of the power of the Father’s infinite mercy” (EG,24). 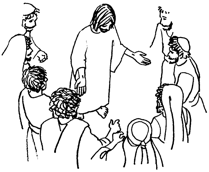 Children’s Liturgy Catechists: There will be a half-an-hour meeting for you after the 9.30 mass on Sunday 19 April. Do you have children in Year 9 or 10 who want to receive Confirmation this year? We are having an overnight “Confirmation Gathering” fun-event at Barnstondale Activity Centre 8th to 9th May. Please contact Mike Daly on – daly.m or leave your details and that of your child at St John’s presbytery. All details must be received before 22 April to ensure inclusion. CaFE (Catholic Faith Exploration) – This coming Thursday, 16 April, the first module “The Father’s Love” will be held in the Parish Centre from 7.30-9.00pm. Five further sessions follow in succeeding weeks. Mon 13 April]. All welcome. Admission free. God’s majesty never tires of giving. Nor can he exhaust his mercies. Let us not tire of receiving. May he be blessed for ever. Amen! WORD FOR TODAY Faith means that, although we cannot see God in the flesh, we are sufficiently receptive to the signs of his risen presence in our world, that not to believe would make no sense. And for Christians the only way forward is by faith. Faith in Focus: A JOHN OR A PETER? When the women told John and Peter that Christ’s body was missing from the tomb they both set off running to the grave. Because John was much younger, and presumably fitter, he arrived first but waited for Peter before going into the tomb. When Peter saw the scene he saw an empty tomb. But when John went in he saw that Jesus had risen. And there’s the big difference. They saw the same scene very differently. Peter notices that the body is gone. John, on the other hand, seems to grasp the reality behind the empty tomb. He believes, understands the meaning of the scriptures and accepts that Jesus is no longer dead but alive. While Peter’s world has suddenly become dismal, bleak and confusing, John’s is about excitement, joy, peace, hope and life. And remember that they are both looking at the same thing. Fortunately, Peter cottoned on fairly quickly! That first Easter scene is a mirror of our world more than 2000 years later. Today there are still many things that bring us to our knees. There are still wars, murders, political intrigues in government and Church, famine, sickness, racism, scandals, poverty, exploitation, unemployment…the list is endless. Each of us can view life as an empty tomb, something to grieve over and a cause of bitter sorrow. Or we can see the same thing as full of hope, expectation and light. The choice is between a mentality that sees life as basically cruel, hostile and cold (Peter) or as full of possibility, crammed with life-giving chances to bring hope, trust and growth (John). The resurrection did not abolish tears and pain from our lives; we have to wait till the end of time for that. But what it does do is to allow us to see through the obvious, beyond the empty tomb to a hope that beckons. That’s what St Paul means when he speaks about our thoughts being on heavenly things. We do not deny the reality of sin, evil and death in our world. But because we are baptised into Christ’s resurrection we share a risen life that also lets us see God alive and active in our moments of emptiness and pain as well as in our times of joy. For those who believe in the resurrection life can never be the same again. Tombs, grave clothes and shrouds now lose their meaning, for Christ is risen from the dead. The evil hold of death and sin has been overcome. It may indeed threaten us, but once and for all its grip has been broken as the power of God triumphs. Jesus is Lord of all creation! So Peter set out with the other disciple to go to the tomb. They ran together, but the other disciple, running faster than Peter, reached the tomb first. Don’t forget to take a look at the Church Notice Boards giving details of other events. There will be no tea after mass on Easter Sunday. Peter Carr, Colette Howes, Frances Heslin, Liam Halpen, Josie Cohen, Peter Williamson, Kathy Smith, Marjorie Hoey, Esther Roche, Fay Challoner, Sheila Stockley, Joan & Charles Reynolds, Kath Holland, Mary Bryden, Josie Toohey, Helen Worth, Christopher Hadfield, Christopher & Raymond McNally, Winifred Sweeney, Anthony McLean. Pray also for those in the parish who do not wish their illness known publicly. Please note with regard to your donations to our mass collections for the parish (Gift Aid); If your circumstances have changed and you no longer pay Income Tax please let Father Bernard know or contact the parish organiser Steve Bell (0151 644 7512). If you do pay tax and are not in the Gift Aid Scheme, why not join and help the parish benefit from some of your Income Tax? If you do not pay Income Tax but your wife or your husband is a tax payer, why not get them to join? Please remember those who have recently died, especially Julia Higgins, Rachel Mulrooney and Peter Smith. May they rest in peace. Their funeral masses will be later this month. Him as risen! This will bring you joy. The brilliance! The beauty! The majesty! The victory… and all of that He desires for you! An open meeting to plan for the Parish Summer Fair will take place on Mon 20 April at 7.30pm in the side chapel. Please come along and help with suggestions! Churches Together in Wirral – Course on the Bible in history and today – The Revd Dr David Lamb leads six sessions looking at the Bible’s origins, authority and interpretation. It will consider what ‘Bible’ means, how we use it today and how it can be relevant in church and society. Starts Tuesday 14 April, from 8pm to 9.30pm at Christ Church, Upton Road, Moreton, Wirral CH46 OPA To book email jane.hood or call 01928 718834 ext 257. CaFE (Catholic Faith Exploration) – The first module “The Father’s Love” will be held in the Parish Centre Thu 16 April, 2015 from 7.30-9.00pm. Five further sessions follow in succeeding weeks. General Election Wirral South Hustings. – 0151 609 0943) by Mon 13 April] All welcome. Admission free.